Each team must comply with their conference's Safe Sanctuary Policy. 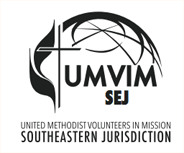 Team Leaders should check with their Conference UMVIM Coordinator for specific policies, requirements or expectations related to Safe Sanctuary/Child Protection Policies, background checks and insurance prior to registration on the UMVIM, SEJ site. If you have any questions, please contact your Conference UMVIM Coordinator or our office. If your conference does not have a Safe Sanctuary Policy or you need to review one to complete your Release of Claim, please click below to download a general one that we have created.